Jib cranes are an economical solution for moving materials within individual work areas or from one work area to another. They can also serve as auxiliary lifting devices under overhead cranes. There are a variety of jib cranes on the market today, with styles ranging from entirely self-supporting to ceiling/bridge or wall-mounted. When selecting a jib crane that matches your individual requirements, it’s important to think about your operation type, facility structure, cost of the unit and installation, and any necessary options, like motorized rotation, box track festooning, boom locks, and rotation stops. Capacity: The maximum weight of the application should never exceed the rated capacity/design weight. 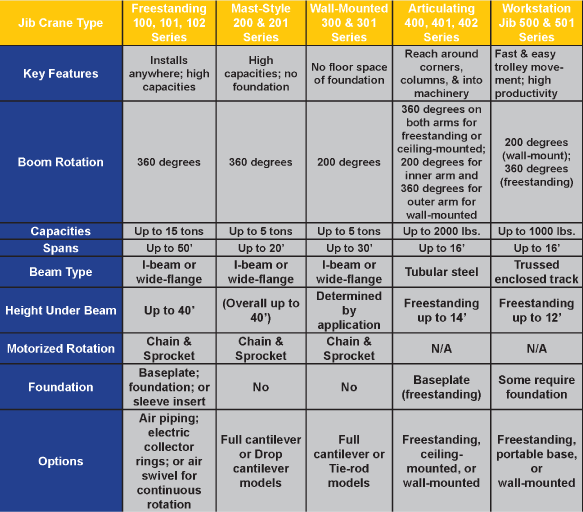 The capacity rating is based on a design load that includes the capacity rating of the crane plus 15 percent of the capacity for the weight of the hoist and trolley and 25 percent of the capacity to allow for additional impact. The deflection is based on a design load that includes the capacity plus 15 percent of the capacity for the hoist and trolley. Ensure your manufacturer is using design criteria that allows the least amount of deflection so as not to hamper the performance of the crane. Height Under Boom (HUB): The distance from the floor to the underside of the boom. It’s important to consider the size of the hoist and the amount of lifting distance when deciding on your HUB. Overall Height: The height to the highest point on the crane after installation. Any attachments, such as electrical entry, should also be considered to provide full rotational potential and freedom from overhead obstructions. Working Span: Distance from the floor to the underside of the jib crane’s boom. Also factor in the size of the hoist and the lift height needed. The working distance or hook distance is approximately one-half the trolley length from the end of the beam and the same distance from the head assembly or vertical support member of the jib. Boom Rotation: Freestanding and mast-type jib cranes provide 360-degree rotation. Wall-mounted jibs offer 200-degree rotation, and articulating jibs provide 360-degree rotation on the inner and outer arm (freestanding and ceiling-mounted) and 360-degree rotation on the outer arm and 200-degree rotation on the inner arm (wall-mounted). Power Requirement: How much power is necessary? Is the power for rotation, trolley, hoist, or all three? (standard powered jib rotation is approximately 1/2 R.P.M). How will the power be supplied? Bottom or top entry? Electric or air? Weatherization: Does the system or its electrical components need to be weatherized for outdoor use? Installation: Can the crane be assembled easily to reduce cost? The location will also dictate the type of crane to be selected to insure proper installation. Freestanding jibs require reinforced concrete foundations which can cost more than the crane itself. Because they are self-supporting, freestanding jib cranes are well suited for outdoor use and can be fully weatherized.